Of all the cranial nerves, the facial nerve is the most susceptible to injury. This nerve travels a complex course through the temporal bone, confined within a prolonged bony canal that is, in some cases, not much greater in diameter than the nerve itself. The susceptibility of the nerve to paralysis can be attributed to these anatomic factors. Facial nerve paralysis can result in devastating social consequences for the patient. The seventh, ie, facial, nerve contains motor, sensory, and parasympathetic fibers. Among its functions are the vital control of facial expression, taste to the anterior two thirds of the tongue, and salivary-gland and lacrimal-gland secretion. Although the facial nerve is susceptible to trauma along its entire length, the temporal bone is the most common site of trauma resulting in facial paralysis. The objective of this article is to review facial paralysis resulting from trauma to the intratemporal bone. Approximately 5% of people who have trauma have temporal bone fractures. These fractures are traditionally classified with respect to the axis of the petrous ridge and include longitudinal, transverse, and mixed (or oblique) types. Longitudinal fractures are most common (70-80%), followed by transverse (10-20%) and mixed (10%) fractures. Facial paralysis most commonly occurs after transverse fractures of the temporal bone (50%). However, paralysis also occurs after longitudinal fractures (25%). Given the propensity in the literature to reference fractures as longitudinal, transverse, and oblique, this traditional classification system is used for discussion purposes. Temporal bone fracture caused by blunt closed-head trauma is by far the most common cause of traumatic facial paralysis. Motor vehicle accidents are the most common mechanism of injury (31%), followed by assaults, falls, and motorcycle accidents. Blunt extratemporal trauma to the face is a rare cause of paralysis and can be delineated from intratemporal bone trauma because it often involves only specific branches of the facial nerve. Penetrating injuries (eg, lacerations, stab wounds) generally result in lesions to the facial nerve distal to the stylomastoid foramen. However, penetrating injuries from gunshot wounds can injure both the intratemporal and extratemporal portions of the facial nerve. Iatrogenic injury during otologic or parotid surgery and injury caused by birth trauma represent rare but important causes of traumatic facial paralysis. In a comprehensive review of the literature, Chang and Cass (1999) reported surgical findings of 4 types of facial nerve pathology after temporal bone trauma. The authors' review of 67 longitudinal fractures from 3 studies revealed that 76% of fractures had bony impingement or intraneural hematoma, and 15% had transection. The remainder had no visible pathology except neural edema. In contrast, of 11 transverse fractures reviewed, 92% were transected, and 8% had bony impingement. Patients with multisystemic trauma require thorough evaluation for possible facial nerve injury. This examination is often relegated an inferior priority given the frequency of injuries more serious than this or life-threatening injuries (eg, intracranial-hemorrhage). The mechanism and details of the traumatic forces involved are important historical factors. Substantial blows to the head are necessary to injure the temporal bone. The region of the head that received the blow is also important. Frontal and occipital blows are most likely to result in transverse temporal bone fractures, whereas lateral blows are most likely to produce longitudinal fractures. The onset and progression of facial paralysis are opined to be important, although these are difficult to determine unless thorough assessment is performed at initial presentation. Patients with nerve transection present with immediate-onset of paralysis and have a poor functional outcome. Hematoma and impingement injuries may have a delayed manifestation and often indicate an improved prognosis. Hearing loss or vertigo suggest temporal bone trauma and can be associated with facial nerve injuries. After the patient's condition is hemodynamically secured and the acute injuries are stabilized, he or she should be evaluated early for signs of facial nerve injury. The examination should include assessment of facial nerve function and hearing status, including otoscopy to evaluate the middle ear. Initial evaluation of a patient with trauma is often delayed because emergency and life-threatening injuries are treated. However, even in an unconscious patient, gross facial function can be elicited as a grimace in response to painful stimuli. Particular attention should be paid to any facial nerve function at presentation. Otoscopic examination of the external auditory canal (EAC) may reveal a step deformity or bleeding from a lacerated canal wall. Examination of the tympanic membrane and middle ear for hemotympanum and perforation is essential. If a perforation of the tympanic membrane is present, the ear may have bloody and/or clear (CSF) discharge. Any of the above otoscopic findings suggests a longitudinal fracture of the temporal bone and potential for facial nerve injury. Nystagmus secondary to vestibular system injury is another sign of temporal bone fracture. In a patient who is conscious and stable, thorough examination of facial nerve function, including topography, can be performed to indicate the location of the lesion. This examination may involve tympanometry with testing of the stapedial reflex, Schirmer to evaluate tear production, and chemical gustometry to test taste. In practice, these tests are not readily available on an urgent basis, they are difficult to perform in an acutely injured patient, and their results may not be predictive of the site of injury. Therefore, their usefulness is questionable. Tuning-fork tests (eg, Weber or Rinne tests) can be performed easily in an emergency department, and its findings may substantiate conductive hearing loss. Conductive hearing loss is most commonly associated with longitudinal temporal bone fractures, whereas transverse fractures are most commonly associated with sensorineural loss. Surgical indications for posttraumatic intratemporal facial paralysis remain controversial and poorly defined. Most patients with intratemporal trauma causing facial paralysis recover fully without intervention. The authors know of no randomized controlled studies of surgical versus nonsurgical treatments for facial paralysis. In general, recommendations for exploration of the facial nerve are contentious and based on personal opinion and data from case series to identify poor prognostic factors and define the population most likely to benefit from surgery. Paralysis versus partial paresis is probably predictive of the degree of recovery. If a patient has incomplete paralysis, the likelihood of full recovery of normal facial function is excellent. No data suggest that surgical intervention increases the likelihood of full recovery when facial paralysis is delayed in onset. The vast majority of patients with delayed-onset facial paralysis have recovery of normal facial function. Patients with immediate onset of a complete facial paralysis have a relatively poor prognosis, often due to transection of the facial nerve and the time of injury. The difficulty arises in that approximately 50% of patients with immediate-onset, complete paralysis recover normal or near-normal facial function. Electrodiagnostic testing, primarily electroneuronography (ENoG) as Fisch (1981) popularized, has been used to determine which patients will not have full recovery. Scientific data to justify the use of ENoG criteria to define which patients should be offered surgery is limited. Extensive data from nonrandomized studies are available to support use of ENoG to treat Bell palsy. Data on its use to treat traumatic facial paralysis is only emerging and confined to case series. Similar to the data for Bell palsy, findings in this setting suggest a favorable prognosis in patients with degeneration of less than 90% within 6 days or less than 95% within 14 days after their injury. More than 90% of individuals without poor prognostic factors are likely to recover normal facial function. Traditional electromyography (EMG) performed by using intramuscular recording electrodes is probably most useful if more than 2 weeks has passed after the paralysis. A management algorithm has been developed to integrate these prognostic factors to determine when surgery is warranted, as depicted in the image below. 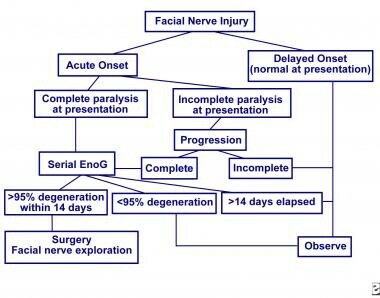 Proposed algorithm for the management of intratemporal injury to the facial nerve. As CT scan resolution technology has improved, more recent studies take into account CT scan findings when considering surgical exploration. [8, 9] Although ENoG remains the most accurate test for guiding treatment, it is often unfeasible to perform in the multiply injured patient or is not readily available. Iatrogenic paralysis is unique among the causes of traumatic facial paralysis. When paralysis occurs after temporal bone surgery (mastoidectomy), repeat exploration of the surgical site is indicated. Nerve decompression and/or repair of the nerve are performed as the findings dictate. The facial nerve is a complex nerve with motor, sensory, and parasympathetic contributions. Motor fibers originate in the facial nucleus and innervate the posterior belly of the digastric muscle, stylohyoid muscle, stapedius muscle, and muscles of facial expression. The facial nerve carries cutaneous sensory fibers from the EAC, tympanic membrane, and areas of the external ear and postauricular region are carried to the fasciculus solitarius. The geniculate ganglion represents the nucleus of the sensory root of the facial nerve. Parasympathetic fibers originating in the superior salivatory nucleus and entering the facial nerve as the nervus intermedius innervate the lacrimal, submandibular, and sublingual glands, as well as glands of the nose, sinuses, and palate. Also included in this portion of the facial nerve are special sensory fibers carrying taste from the tongue. Given the different fibers carried in the facial nerve, some authors advocate a complete topodiagnostic assessment of extrafacial branches of the facial nerve to identify the site of lesion. With this in mind, the facial nerve can be divided into 6 segments. From proximal to distal, they include the intracranial, meatal, labyrinthine, tympanic, mastoid (ie, vertical), and extratemporal segments. Two of these segments are outside the temporal bone. In the proximal portion, the intracranial segment extends from the brainstem to the internal auditory canal (IAC). In the distal portion, the extratemporal segment extends from the stylomastoid foramen to the muscles of the face. The intratemporal segments are of particular relevance in temporal bone trauma. The meatal segment extends from the porus of the IAC to the meatal foramen. The meatal foramen represents the narrowest (0.68 mm) portion of the facial canal. The nerve runs superior to the transverse crest and anterior to the vertical crest (Bill bar) of bone at the distal IAC before entering the facial canal. The shortest segment, the labyrinthine segment (3-5 mm), extends from the meatal foramen to the geniculate ganglion. Its initial lateral course is followed by an anterior curve between the basal turn of the cochlea and the vestibule. The end of the labyrinthine segment is marked by the formation of the geniculate ganglion. In this region, the greater superficial petrosal nerve carrying fibers to the lacrimal gland leaves anteriorly from the ganglion by means of the hiatus of the facial canal. The greater superficial petrosal nerve travels anteriorly, carrying parasympathetic fibers, for instance, to the lacrimal gland. The Schirmer test for tear secretion is purportedly useful to assess the function of this branch. Adequate tear secretion implies a site of lesion distal to the geniculate ganglion. The tympanic segment courses in a posterior direction following a 40-80° turn of the first genu at the geniculate ganglion. 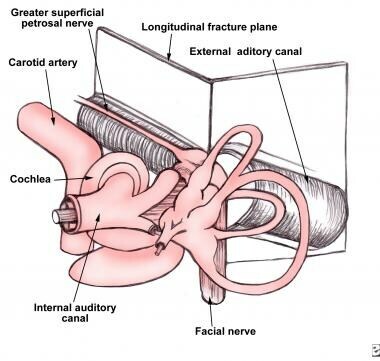 The facial nerve then enters the medial tympanic cavity, running in the facial canal and curving around the oval window niche. At this point, the nerve runs superior to the oval window niche where the bone of the facial canal can be thin and where it may be dehiscent in as many as 55% of individuals. 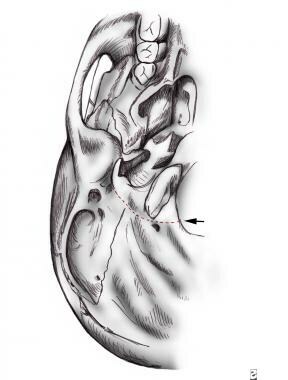 The distal tympanic segment lies just anterior and inferior to the lateral semicircular canal, where the nerve curves through its second genu and begins its vertical descent. Most intratemporal traumatic injuries occur in the perigeniculate region and labyrinthine segment. The mastoid (ie, vertical) segment of the facial canal is the longest of all segments (10-14 mm). It extends from the pyramidal process to the stylomastoid foramen. The stapedius muscle lies medial to the facial nerve and receives its motor branch in this segment. Tympanometry with stapedial-reflex measurement is performed to assess the function of the facial nerve at this level. 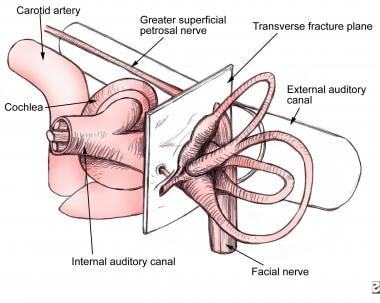 Lastly, the chorda tympani nerve, which carries efferent fibers to the submandibular and submaxillary glands and special afferent (taste) fibers from the tongue branches from the facial nerve in this segment. Chemical and/or electrical gustometry can be used to assess the sense of taste on the anterior two thirds of the ipsilateral tongue. Classic longitudinal fractures extend from the temporal squamosa along the roof of the EAC and petrous apex to the foramen lacerum, as depicted in the 1st image below. The fracture injures the tympanic membrane, facial canal, and middle ear, resulting in ossicular disruption and conductive hearing loss, as depicted in the 2nd image below. Because the otic capsule is made of dense bone, the fracture line often courses around this structure. Fracture pattern of longitudinal temporal bone fractures. The axis of fracture is parallel to the petrous ridge after a person receives lateral blows to the skull (arrow). Potential fracture plane and structures involved in longitudinal temporal bone fractures. In contrast, transverse fractures extend from the jugular foramen in an anterolateral direction across the petrous pyramid ending at the foramen spinosum or foramen lacerum, as depicted in the 1st image below. In its course, the fracture line may traverse the otic capsule, resulting in sensorineural hearing loss, as depicted in the 2nd image below. Fracture pattern of transverse temporal bone fractures. The axis of fracture is perpendicular to the petrous ridge extending to the foramen magnum after a person receives frontal or occipital blows to the skull (arrow). Potential fracture plane and structures involved in transverse temporal bone fractures. Attention must be paid to other life-threatening complications of trauma before intervention for facial nerve injury is started. Patients without the poor prognostic factors (see Indications) have an excellent probability for good recovery. No data suggest that surgical intervention increases the likelihood of full recovery when the facial paralysis is delayed. Normal or near-normal facial function (ie, House-Brackmann grade I or II) can generally be expected in more than 90% of patients undergoing conservative treatment. Surgical intervention is not indicated in facial paralysis secondary to birth trauma or extracranial blunt trauma to the face. In both these instances, spontaneous and complete recovery is typical. May M. Trauma to the facial nerve. Otolaryngol Clin North Am. 1983 Aug. 16(3):661-70. [Medline]. Gurdjian ES, Lissner HR. Deformation of the skull in head injury studied by the "stresscoat" technique, quantitative determinations. Surg Gynecol Obstet. 1946. 83:219-233. Dahiya R, Keller JD, Litofsky NS, Bankey PE, Bonassar LJ, Megerian CA. Temporal bone fractures: otic capsule sparing versus otic capsule violating clinical and radiographic considerations. J Trauma. 1999 Dec. 47(6):1079-83. [Medline]. Chang CY, Cass SP. Management of facial nerve injury due to temporal bone trauma. Am J Otol. 1999 Jan. 20(1):96-114. [Medline]. Fisch U. Surgery for Bell's palsy. Arch Otolaryngol. 1981 Jan. 107(1):1-11. [Medline]. Ulug T, Arif Ulubil S. Management of facial paralysis in temporal bone fractures: a prospective study analyzing 11 operated fractures. Am J Otolaryngol. 2005 Jul-Aug. 26(4):230-8. [Medline]. Bodenez C, Darrouzet V, Rouanet-Larriviere M, et al. [Facial paralysis after temporal bone trauma]. Ann Otolaryngol Chir Cervicofac. 2006 Feb. 123(1):9-16. [Medline]. Thakar A, Gupta MP, Srivastava A, Agrawal D, Kumar A. Nonsurgical Treatment for Posttraumatic Complete Facial Nerve Paralysis. JAMA Otolaryngol Head Neck Surg. 2018 Apr 1. 144 (4):315-21. [Medline]. Nash JJ, Friedland DR, Boorsma KJ, Rhee JS. Management and outcomes of facial paralysis from intratemporal blunt trauma: a systematic review. Laryngoscope. 2010 Jul. 120(7):1397-404. [Medline]. Patel A, Groppo E. Management of temporal bone trauma. Craniomaxillofac Trauma Reconstr. 2010 Jun. 3(2):105-13. [Medline]. [Full Text]. Kim J, Moon IS, Shim DB, Lee WS. The effect of surgical timing on functional outcomes of traumatic facial nerve paralysis. J Trauma. 2010 Apr. 68(4):924-9. [Medline]. McKennan KX, Chole RA. Facial paralysis in temporal bone trauma. Am J Otol. 1992 Mar. 13(2):167-72. [Medline]. Darrouzet V, Duclos JY, Liguoro D, Truilhe Y, De Bonfils C, Bebear JP. Management of facial paralysis resulting from temporal bone fractures: Our experience in 115 cases. Otolaryngol Head Neck Surg. 2001 Jul. 125(1):77-84. [Medline]. Quaranta A, Campobasso G, Piazza F, Quaranta N, Salonna I. Facial nerve paralysis in temporal bone fractures: outcomes after late decompression surgery. Acta Otolaryngol. 2001 Jul. 121(5):652-5. [Medline]. Liu Y, Liu S, Li J, Chen X, Sun J, Li Y. Management of facial palsy after temporal bone fracture via the transmastoid approach. Acta Otolaryngol. 2015 Mar. 135 (3):307-11. [Medline]. High-resolution CT scan of the temporal bone demonstrates a longitudinal temporal bone fracture. Number sign marks the lateral extent of the fracture. High-resolution CT scan of the temporal bone demonstrates a transverse temporal bone fracture. Number sign marks the lateral extent of the fracture. Disclosure: Sponsored to attend training workshop for: Cochlear Corporation; MedEl Corporation.